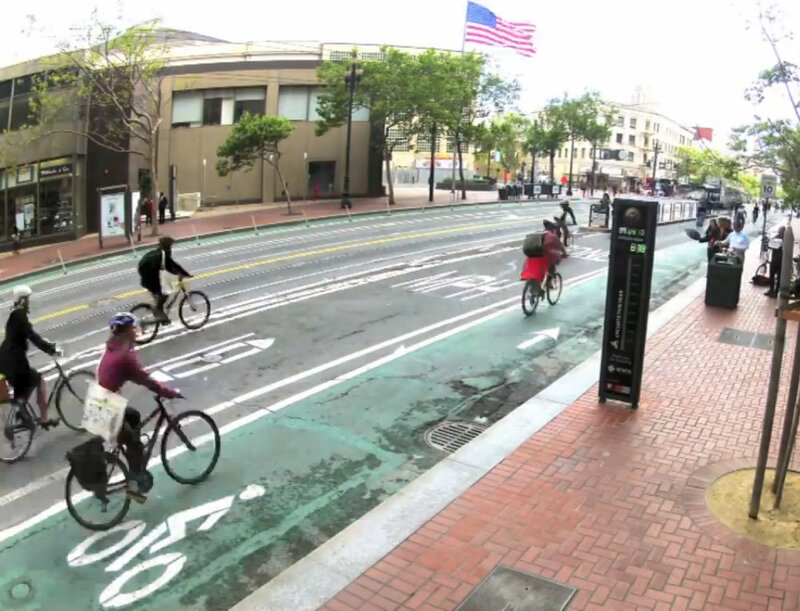 Today we bring you the second and final round of Streetsblog San Francisco’s 2013 Streetsie Awards, highlighting the best and worst in livable streets from the past year. This round will start out with a focus on the worst. As a representative of the San Francisco Police Department, Sergeant Richard Ernst could have chosen a different way to approach the folks at the memorial held where 24-year-old Amelie Le Moullac was killed on her bike at Folsom and Sixth Streets. He could have expressed sympathy for Le Moullac and the other three victims who were killed by truck drivers this year through no apparent fault of their own, or shown support for safety improvements on SoMa streets, as advocates at the scene were calling for that day. Instead, Ernst purposefully parked his police cruiser in the Folsom bike lane where Le Moullac was killed, to make a point of blaming her and everyone else killed on bikes, saying it was his “right” to do so. Later, video footage found at the same scene by an SF Bicycle Coalition staffer would show that the trucker who killed Le Moullac made an illegal right turn. The SFPD apparently didn’t bother to check for that video themselves. Chief Greg Suhr later apologized. But it was too late to take back what Ernst had done. 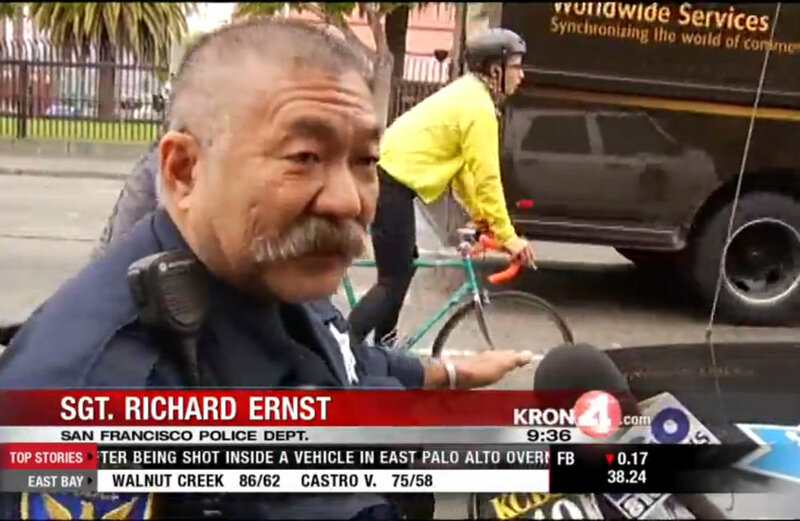 Speaking in full view of the mourners and broadcast news reporters, Ernst’s actions struck a nerve for many victims of less public cased of SFPD anti-bike hostility. His stunt would ultimately spark interest at City Hall in looking into the broader problem — in October, dozens of bicycle riders came forward to share horrific stories at a hearing called by Supervisor Eric Mar. Save Polk Street blew the other NIMBYs out of the water this year. Perhaps their most notorious stunt was to invite out-of-towners to pack a neighborhood meeting and fight for car parking on Polk, safety improvements be damned. The merchant group’s leaders spread fear to galvanize opposition, making up stories about failed bike lanes in other cities. One bookstore owner blamed Polk’s existing bike lanes for a drop in business while, in the same breath, claiming that the street is busier than ever. 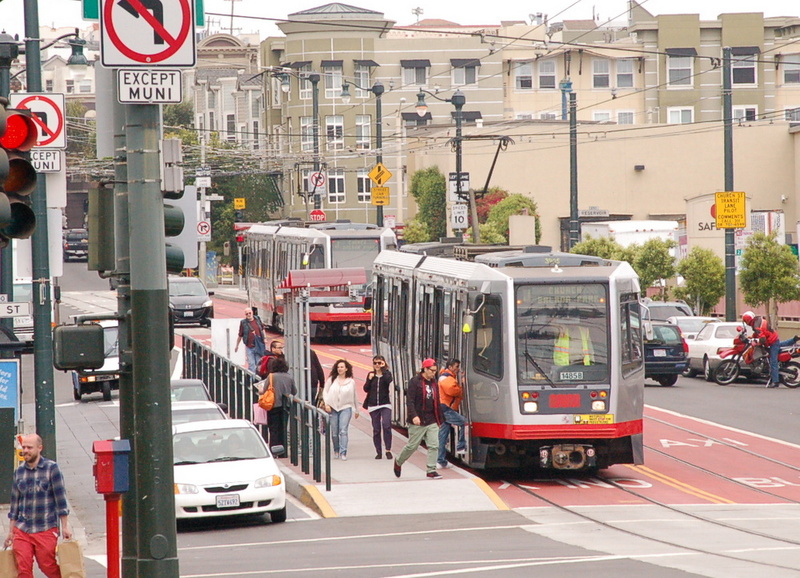 The group has continued to dismiss the SFMTA’s study which found that 85 percent of people on Polk arrive without a car. 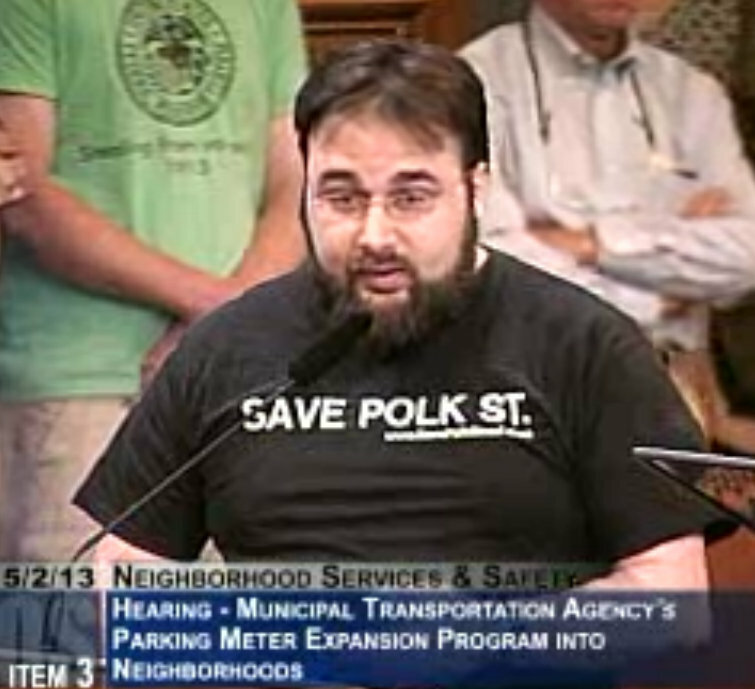 Unfortunately, Save Polk Street’s fearmongering partially succeeded, persuading the SFMTA and Supervisor David Chiu — purportedly a champion of safer streets for biking — to roll back safer bike lanes in favor of parking in the Polk plan. The project still has to be approved by the SFMTA Board of Directors, which wants the option of a full bike lane pilot, but the current proposal is a far cry from the original vision of parking-protected bike lanes along this vital corridor. It’s a troubling precedent when the city caves on safer streets to appease parking-obsessed NIMBYs. All opponents have to do, apparently, is get enough people to yell loudly along with them. Geary Bus Rapid Transit was originally supposed to open in 2012. The current opening date of 2018, believe it or not, was an improvement over the previous one of 2020. But the currently proposed plan will only have center-running transit lanes in the Richmond. It wasn’t all gloom and doom for transit in 2013. SF saw two of the first pilots to come out of the Muni Transit Effectiveness Project on Church Street and the 5-Fulton line. Church between Duboce Avenue and 16th Street saw San Francisco’s first red transit-only lanes for buses (Third Street received the first red transit lanes for light-rail a few years ago). Since they were implemented in March (following a seasonal weather delay), travel times on the J-Church and 22-Fillmore lines have dropped by 5 percent, and the buses and trains are 20 percent more reliable, arriving closer to their scheduled arrival times. Cars can still often be seen in the red lanes, but they’re less likely to delay transit. In October, Muni riders also roundly cheered the launch of the 5-Fulton Limited, a new commute-hour service that came with a package of TEP-type transit upgrades to boost service on the regular 5 line. Some excess stops were removed, some bus stops lengthened, and a road diet was implemented to create wider lanes for buses on a stretch of Fulton. Planners predicted that the 5L should run 11 percent faster than the existing local service (and 17 percent faster on the limited-stop stretch alone). 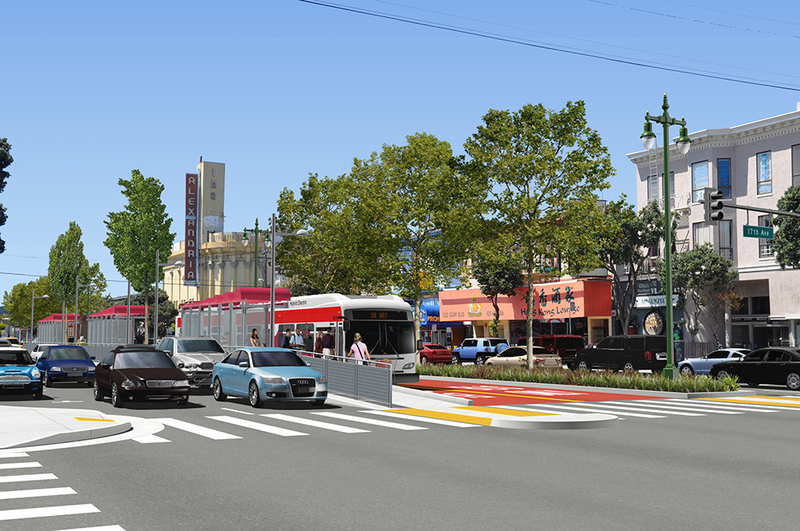 Though the data on improved service isn’t in yet, these improvements, in addition to the 2011 two-way conversion of McAllister’s eastern stretch to provide a more direct route, mark some of the most robust service upgrades ever brought to a Muni bus line. It didn’t quite win the “Best Statement” award this year, but we’ve got to spotlight Mayor Ed Lee’s Transportation Policy Director, Gillian Gillett, for calling on the city to “be San Francisco and take down the freeway.” Since Streetsblog reported on the idea in January, the public conversation about the city’s next freeway removal has gained serious momentum, with the northern spur of 280 being eyed for conversion to a street-level boulevard to help accommodate high-speed rail. The counter, located at Market and Eighth Streets, currently counts well over 3,000 bikes on a regular day. Finally, we can keep tabs on our progress towards Copenhagenization (Copenhagen’s Nørrebrogade sees over 36,000 bikes a day). It also serves another purpose, as a symbol showing bike commuters and passersby that San Francisco values its pedaling public. There aren’t many major street improvements in the construction pipeline for 2014, but there are a couple of good livable streets projects to look forward to. 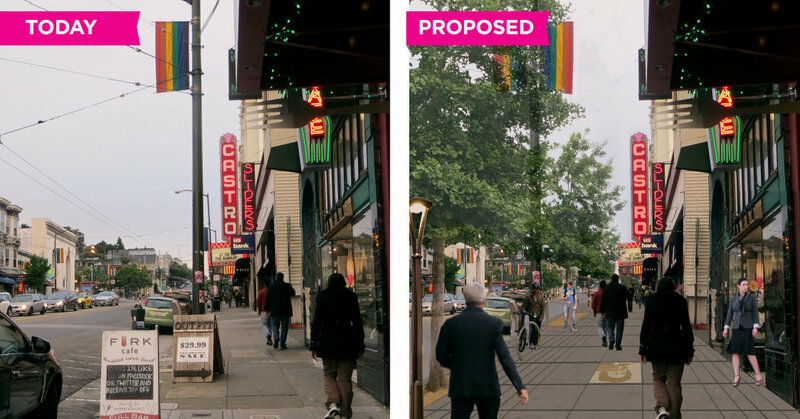 Starting in January, the busy stretch of Castro Street will be revamped with wider sidewalks, finally bringing the kind of human-scale treatment this famous street deserves. In the summer, the easternmost block of Haight Street will get the city’s first contra-flow transit-only lane, along with pedestrian safety upgrades at the intersection with Market and Gough Streets, removing a notoriously slow and unnecessary detour on the 71-Haight/Noriega and 6-Parnassus lines. Here’s to building momentum for more livable streets and better transportation options in San Francisco in 2014. Happy New Year, Streetsblog readers! Still waiting for some real evidence that the Polk Street meeting was packed with “out-of-towners.” You folks just find it hard to believe that people In Polk Gulch don’t want to lost 200 parking spaces to make bike lanes. The outsiders claim reminds me of the Civil Rights era, when many white folks couldn’t believe that black people in their communities were dissatisfied. Must be “outside agitators” stirring up trouble instead! 85% of visitors to Polk Street don’t come by car? 15% do, however, and only 5% arrive by bike. Which means that Polk Street must be redesigned to cater to that 5%! Love the bike counter! Nice design, too. Oftentimes in a morning commute peleton or even when two or three bikes are going over at short intervals, I’ll notice that the counter only accounts for a portion of them. I imagine this is a sensor issue, but I wonder if it’s impossible to fix? I posted the video. We analyzed the tape and cross-referenced it with our facial recognition software. Strangely, about 28% of the attendees had a Salt Lake City address. Further research showed that they were backed by the same groups funding Prop 8. Wait. Did you just claim that the people of Polk Street are oppressed in a manner similar to African-Americans in the Jim Crow South? Where did you post the video? I’d like to take a look at it. By the way, how did you get their addresses? how did you get their addresses? We got their addresses from our secret Agenda 21 database. Every time someone posts an internet rant against cyclists, or strays into a transit-only lane, or complains about loss of parking at a public planning meeting, their name and address is entered by a bearded hipster into a database, on a secret solar-powered server farm hidden inside an LRV maintenance facility in Portland OR. The people in that database will be the first against the wall when the revolution comes and we are finally freed from our petroleum-based shackles. We are the sustainable transportation mafia. We are legion. It’s a classic guilt by association fallacy. Sustainable streets advocates are claiming that their opponents packed a local meeting with people outside of the area in question. White supremacists during the Jim Crow era also claimed that their opponents packed a local meeting with people outside of the area in question. You don’t want to be like those nasty white supremacists now do you? Har har. But I bet down the road someone will cite this in support of the unsupported notion that the famous anti-bike public meeting in Polk Gulch was packed with people from out of town. The funny thing is that you’re such a firm believer that there’s a conspiracy to steal all your parking run by Streetsblog/SFMTA/SFBC that you took murphstahoe’s obvious caricature at face value. Joke’s on you, Rob. No conspiracy. It’s all done in plain sight, with noticed meetings and pro forma community outreach by the MTA. The community target for these “improvements” will never get a chance to vote on them. Still why does Aaron keep suggesting that the meeting was packed? To keep the lie alive and rally the faithful.